Algiers (الجزائر‎ in Arabic) is the capital and with 3.5 million inhabitants the largest city of Algeria. It extends for 20-30 km along the Mediterranean coast. The internatiuonal airport in the east of Algiers is 18km southeast of the Casbah, the historic centre of Algiers which was declared a UNESCO world heritage site in 1992. The Casbah and the adjacent colonial area with the Neoclassical buildings contain most of the touristic highlights of Algiers. There are a number of mosques and other old buildings. The Notre Dame d'Afrique basilica is on a hill west of Algiers and offers good views of the Casbah. The Martyrs' memorial is an impressive monument dedicated to those who died in the Algerian war of independence. It was opened in 1982 and is 92m tall. For a large city as Algiers, there are very few modern, international level shopping malls. Currently the Great Mosque of Algiers is being built. 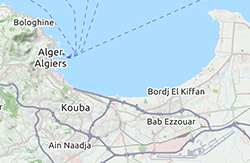 It is possible to reach Algeria from abroad by plane or ferry. 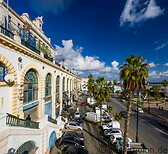 Algiers has a train station with trains to a number of cities in Algeria. It is well connected to the Algeria road network. Hotels are available in Algiers. Many are bookable via the international booking portals.